La Excelencia returns to Nashville on Friday, October 12 as part of Vanderbilt University’s Great Performances series. 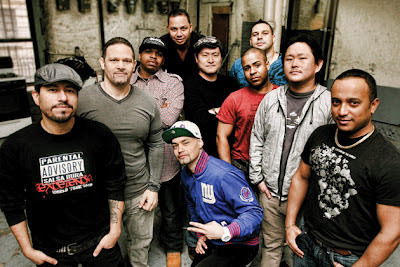 The world famous New York City salsa dura band will perform at 8:00 PM in Ingram Hall. A community salsa class free to all ticket holders will be taught at 6:30 prior to the show by Nashville’sGlobal Education Center resident teaching artist, Steven Damo of Sentir El Ritmo. EXCITED! We got a taste of Nashville last year and had a great turn out, but by the 3rd or 4th song the rain started pouring down and we did not get to finish the show. La Excelencia is, however, very blessed that we are able to return to finish the job thanks to Vanderbilt University! For the full interview with Jose Vazquez-Cofresi, go here. 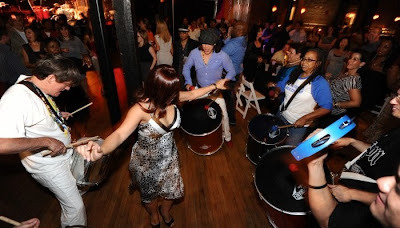 The band known and enjoyed internationally as “The New Generation of Salsa Dura” has been featured by the BBC, The New York Times, Latin Beat Magazine, So You Think You Can Dance and in motion pictures. Grammy-winning producer Aaron Levinson says of the group known as “The New Generation of Salsa Dura”: “La Excelencia represents something very significant, a return not just to the classic formula of salsa but to the virtues of it. They are going back to the more eclectic period when salsa was street music, playing with spirit and integrity and writing socially relevant music again.” Vazquez-Cofresi names their top three culturally important songs addressing discrimination and poverty: "Dale Otra Oportunidad and "La Economia". Tickets for the Great Performances series are on sale at Sarratt Student Center. Full information on discounts for students, seniors, Vanderbilt faculty and groups can be found at www.vanderbilt.edu/greatperformances. Tickets range from $5 for Vanderbilt students to $30, $35, and $40 for the general public. Information is also available at the Sarratt Student Center open Sunday–Saturday 10 a.m. – 8p.m, by calling 615.322.4230, and at all Ticketmaster outlets. The following is my response to Is ‘Illegal Immigrant’ the Right Description? 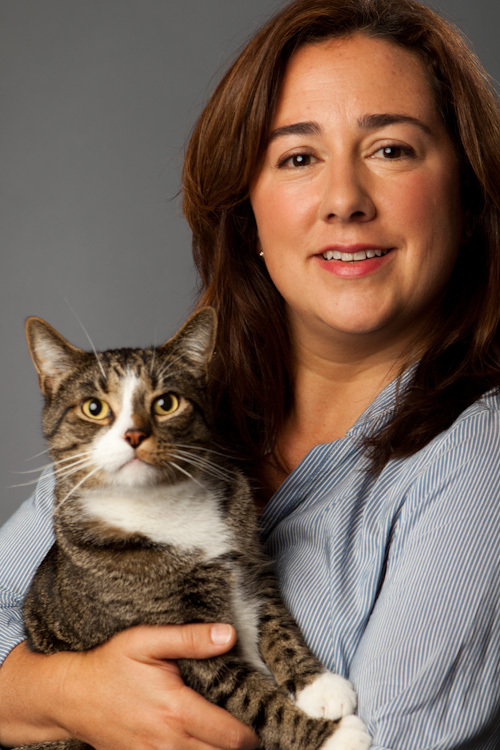 on the Public Editor's Journal blog written by Margaret Sullivan, Public Editor of the New York Times. It’s not the single use but the overuse of the term that is the problem. Out of all reported stories about breaking the law, the immigration beat disproportionately uses and repeats law-tinged labels of the perpetrators. In headlines outside the immigration beat, the "sin" is more often the story, and not the "sinner." I've seen this borne out in my hometown newspaper. Kids killed while breaking the law in a vehicle not meant for on-road use prompt a headline about "golf cart culture," not the kids as wrongdoers. Illegally causing pain to a Tennessee Walking Horse to modify its gait in competition? The headline is about the alleged "soring," not the accused. Medicinal abuse merits an above-the-fold reference to the "pill problem," not "pill poppers." Even stories about overeating at church harp on gluttony, not "gluttons." No doubt that the outside the immigration context, stories identify perpetrators with terms like "tax evader," "poachers," and "traffic violators." A newsroom should ask itself, however, why those labels appear at such a lower ratio of total word count than the legal labels of immigrants in immigration stories. Once you've seen the difference, it's hard to argue that the difference in justified, much less neutral. Mallary Tenore's comment about detail and variation in descriptions is instructive. Increasing the use of words like "deportation" or "visa" might add variety. Questioning the redundancy of any given mention of illegality also helps. In honor and celebration of Hispanic Heritage month in the United States which runs from September 15-October 15, the Williamson County Public Library has organized a “Ballet Folklorico” with invited guest, Destellos Culturales de Nashville. According to the group’s website, Destellos Culturales de Nashville is “a non-profit organization from Nashvhille, TN promoting Culture, Art, Health, and Sports.” The event will take place on Sunday, September 23rd with two shows at 2:00pm and 3:30pm. Come and enjoy! Film: "Granito: How to Nail a Dictator"; Vanderbilt's Sarratt Cinema at 7:30pm, presented by International Lens and Center for Latin American Studies. In a stunning milestone for justice in Central America, a Guatemalan court recently charged former dictator Efraín Rios Montt with genocide for his brutal war against the country’s Mayan people in the 1980s. Pamela Yates’ 1983 documentary "When the Mountains Tremble" provided key evidence for bringing the indictment. 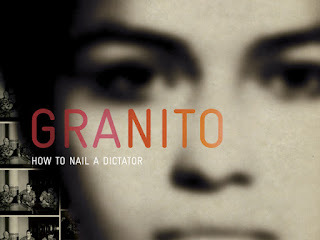 "Granito: How to Nail a Dictator" tells the extraordinary story of how a film, aiding a new generation of human rights activists, became a granito — a tiny grain of sand — that helped tip the scales of justice. An Official Selection of the 2011 Sundance Film Festival. A co-production of ITVS with funding provided by the Corporation for Public Broadcasting. A co-presentation with Latino Public Broadcasting. 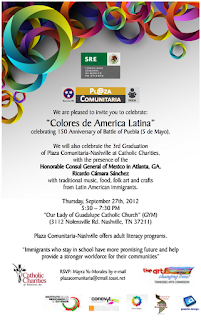 We will also celebrate the 3rd Graduation of Plaza Comunitaria-Nashville at Catholic Charities, with the presence of the Honorable Consul General of Mexico in Atlanta, GA. Ricardo Cámara Sánchez with traditional music, food, folk art and crafts from Latin American immigrants. 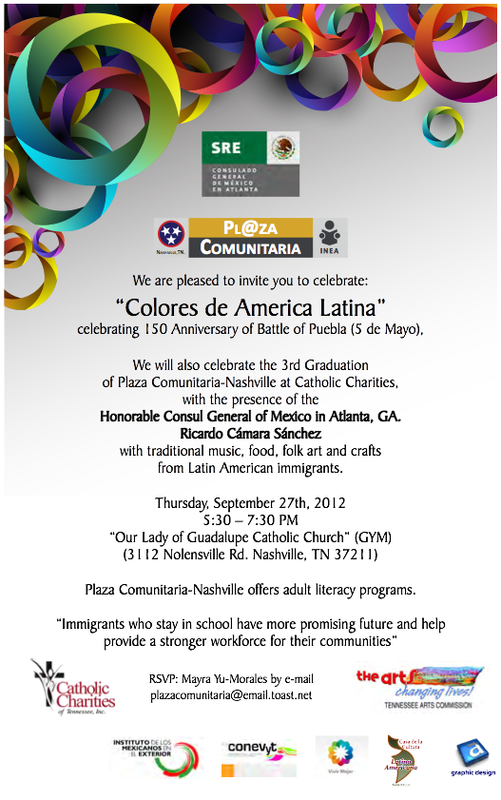 Plaza Comunitaria-Nashville offers adult literacy programs. NASHVILLE'S FREE MULTICULTURAL EVENT CELEBRATES THE CITY'S DIVERSITY WITH FOOD, MUSIC and PERFORMANCES, CHILDREN'S ACTIVITIES, TEENS ACTIVITIES, ARTS & MARKET PLACES, AND MORE! 10 AM to 6 PM at Centennial Park. Admission and parking are free. In a city where one in six residents is foreign-born, the Celebrate Nashville Cultural Festival is not only Nashville's favorite and most vibrant cultural festival, but a timely reminder of what makes Nashville a great place to live. The annual festival brings together over 40 cultures and 60,000 people living in Nashville and surrounding communities, and encourages understanding, appreciation and respect. The 2012 Festival features more than 100 performances on 7 different stages (including the Musician's Corner stage this year! ), over 50 food vendors offering exotic tastes from around the world, hands-on children's activities, a marketplace and art bazaar, promotion in over 12 different languages, and more. Be transported around the world...right here in Nashville! Presented by Nashville Metro Human Relations, the Global Village offers an authentic look at the customs and traditions of the participating cultures that are present within the City of Nashville and the surrounding counties. As you walk through, you'll hear traditional music in the background as the native language of each area is spoken. You'll see clothing, instruments, and other artifacts that are customary for each country. A center stage in The Global Village showcases talents & traditions. The Global Village has included countries such as Panama, India, Ethiopia, Japan, China, Madagascar, Kurdistan, Norway, Mexico, Bolivia and Ecuador and more! The World Market is filled with booths selling unique hand-crafted and imported items from around the world. Walking through the World Market you may also see how some of these items are made while enjoying music from the World Market Stage. Further, the World Market is a gathering place for various nonprofits and service organizations that support and benefit the diversity in our community. An area just for teenagers as seen through the eyes of teenagers! This area is organized by the Oasis Center, and teens from our community display information reflective of their heritage and their current lifestyle. Music and dance performances are ongoing throughout the day on the Teens United Stage. The Children's Area is a highly interactive area that has something for every age! Other activities include a Maypole, "dress up" with costumes from the Metro Parks Theater Department, painting, games and demonstrations of cricket, bocce, and soccer, storytelling, nature activities, puppet shows, hands-on art and much more! The Children's Area Stage will have interactive music and dance programs throughout the day. New this year, Metro Nashville Arts Commission is hosting an area that will feature local artisans and crafters selling unique, hand-crafted arts and crafts that represent Nashville's diverse cultural landscape. AND, OF COURSE, THE FOOD! Where else can you sample everything from empanadas and falafels to "hot chicken," from injera (Ethiopian bread) and gyros to Mexican popsicles all in one place? Discover exotic flavors of diversity priced right for sampling and enjoyment! Food Vendor, Non-profit, Artist, and Marketing booth spaces are still available. Contact info@celebratenashville.org for more information. Hispanic music, food, and art will take center stage in Volunteer State Community College for the Fall Fiesta. 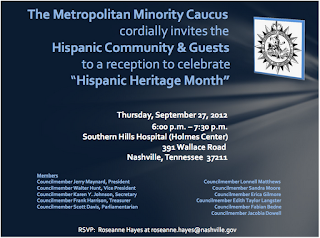 This is the sixth year of the free community event that celebrates hispanic culture. "We highlight the culture of many countries that make up what we call Hispanic culture," said Eric Melcher, Communications Coordinator. "We have a contest of typical foods of different countries. After the judges' decision, the public can try the food." That contest begins at 11 a.m. In addition, there will be a lunch and free drinks at noon. The dance group Hispano América will lead a dance class for festival attendees. Entertainment will also include El Karaoke, and an exhibition soccer tournament of 5-person teams, for which there is a 9am registration deadline. The Fall Fiesta at Vol State is scheduled for Saturday, October 20 from 10 a.m.-4 p.m, rain or shine, on the campus of Volunteer State Community College, 1480 Nashville Pike in Gallatin. Free and open to the whole community. Families are invited to bring picnic blankets and chairs and spend the day with us. 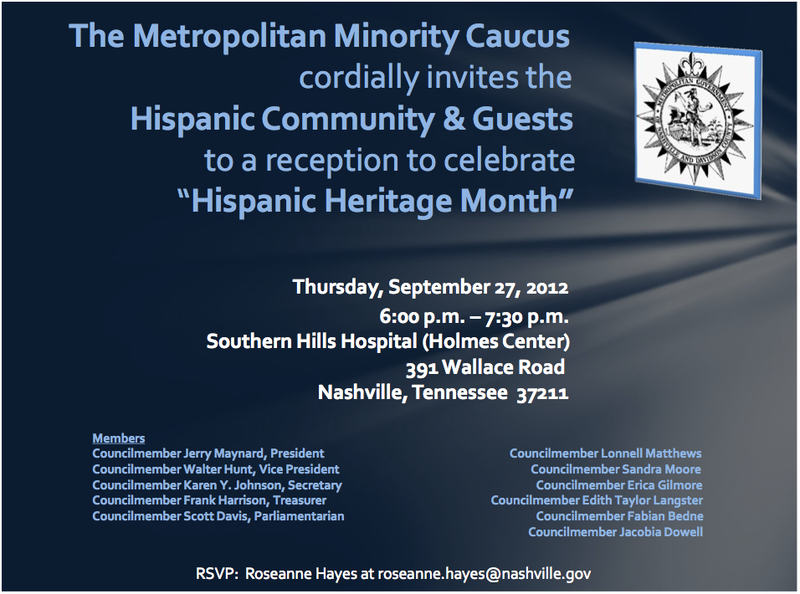 For more information, call 615-230-3570 in English, or in Spanish at 615-230-4846. At 6 p.m., this Saturday, September 15, Conexión Américas will host its annual Hispanic Heritage Celebration at the historic Cannery Ballroom at One Cannery Row. The cost is $40 in advance; click here for tickets. The party starts with a presentation of the winners of the Young Latino Writers Essay Contest “My Hispanic Roots, My American Dream,” and the Orgullo Hispano (Hispanic Pride) award. Authentic Latin American food to be served by Karla’s Catering and Prepared Foods, plus live Latin music by Revolfusion, dancing and other entertainment. Note: This is a 21+ event with a cash bar.